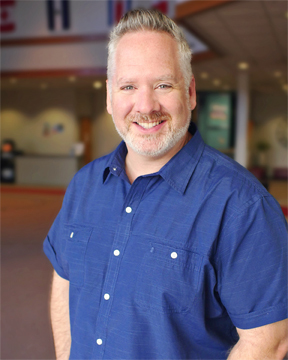 Alan Fath is the Associate Pastor of Worship at First O’Fallon. He has been in ministry for over 23 years, previously serving in Houston, Texas, the Orlando, Florida area, and Mobile, Alabama. Alan is married to Mandy who is a true partner in his ministry. They have a teenage daughter, Gracie and a little dog, Charlie. Alan graduated from the University of Mobile in 1998 and has been privileged to serve in places with wonderful mentors to grow in his craft and ministry. That training has translated into other churches and ministries needing a fresh touch. It’s important for Alan and Mandy to develop a team atmosphere that feels like a family. Work weeks can be hard for worship ministry volunteers; Alan’s goal is that the highlight of the week would be rehearsal time together where everyone can grow, laugh, cry, and learn to be better worship leaders. In his spare time, Alan loves cycling, going to the gym, and exploring the city where he lives. He is a huge Superman fan, and being raised in L.A. (Lower Alabama), he is naturally a crimson tide fan … ROLL TIDE! !